Houghton Mifflin Harcourt, 9780547391403, 272pp. Humans live in landscapes of make-believe. We spin fantasies. We devour novels, films, and plays. Even sporting events and criminal trials unfold as narratives. Yet the world of story has long remained an undiscovered and unmapped country. It's easy to say that humans are wired for story, but "why"? 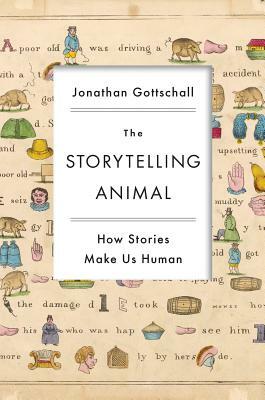 In this delightful and original book, Jonathan Gottschall offers the first unified theory of storytelling. He argues that stories help us navigate life's complex social problems just as flight simulators prepare pilots for difficult situations. Storytelling has evolved, like other behaviors, to ensure our survival. Drawing on the latest research in neuroscience, psychology, and evolutionary biology, Gottschall tells us what it means to be a storytelling animal. Did you know that the more absorbed you are in a story, the more it changes your behavior? That all children act out the same kinds of stories, whether they grow up in a slum or a suburb? That people who read more fiction are more empathetic? Of course, our story instinct has a darker side. It makes us vulnerable to conspiracy theories, advertisements, and narratives about ourselves that are more truthy than true. National myths can also be terribly dangerous: Hitler's ambitions were partly fueled by a story. But as Gottschall shows in this remarkable book, stories can also change the world for the better. Most successful stories are moral they teach us how to live, whether explicitly or implicitly, and bind us together around common values. We know we are master shapers of story. "The Storytelling Animal" finally reveals how stories shape "us. "A lively pop-science overview of the reasons why we tell stories and why storytelling will endure..[Gottschall's] snapshots of the worlds of psychology, sleep research and virtual reality are larded with sharp anecdotes and jargon-free summaries of current research... Gottschall brings a light tough to knotty psychological matters, and he’s a fine storyteller himself." "They say we spend multiple hours immersed in stories every day. Very few of us pause to wonder why. Gottschall lays bare this quirk of our species with deft touches, and he finds that our love of stories is its own story, and one of the grandest tales out there—the story of what it means to be human." "Story is not the icing, it’s the cake! Gottschall eloquently tells you ‘how come’ in his well researched new book." "This is a quite wonderful book. It grips the reader with both stories and stories about the telling of stories, then pulls it all together to explain why storytelling is a fundamental human instinct." "The Storytelling Animal is a delight to read. It's boundlessly interesting, filled with great observations and clever insights about　television, books, movies, videogames, dreams, children, madness, evolution, morality, love, and more. And it's beautifully written—fittingly enough, Gottschall is himself a skilled storyteller." "Like the magnificent storytellers past and present who furnish him here with examples and inspiration, Jonathan Gottschall takes a timely and fascinating but possibly forbidding subject — the new brain science and what it can tell us about the human story-making impulse — and makes of it an extraordinary and absorbing intellectual narrative. The scrupulous synthesis of art and science here is masterful; the real-world stakes high; the rewards for the reader numerous, exhilarating, mind-expanding."